With each passing years, the WordPress experts approach with new varieties of WordPress plugins that the developers and users can use on their websites. As the technology is progressing, experts have provided with some of the must have plugins for WordPress that may be necessary for the users and superb to execute with, giving them satisfaction after proper utilizing. WordPress possesses numerous plugin databases, and every plugin produces custom features and functions thus allowing the users to mold their websites as per their preferences and requirements. WP plugin’s customizations vary from SEO, email sign-up boxes, sharing on social media, eCommerce stores, etc. It is up to you to select the essential WordPress plugins for your website so that you can convey a superior experience for your audiences. We’ve offered you some of the best 16 WordPress Must Have Plugins for Sites that will benefit you greatly, and you use them to build unique, professional looking and user friendly site. You can very easily use the BackupBuddy plugin which also considered as migration plugin, and the best beginner friendly too. With this plugin, you can usually arrange the backup schedule for your site. You should backup your latest blogs on a regular basis so that you don’t lose them unnecessarily. Your backup can be effortlessly stocked up on the cloud. You should (if can afford) install and activate BackBuddy on all of your blogs to keep backup everything, regularly. In case of unpleasing situation, it helps you restore the website to its previous version in a matter of a few minutes. Yoast SEO previously was named as WordPress SEO by Yoast, but it’s changed now. It is a very popular seo plugin that boosts your search engine traffic and helps in optimizing the overall blog articles visibility. With the use of this plugin, you can gain an entirely optimized website and contents. It is very simple to install, easy to use and easy to setup too. You can even include open graph metadata, execute page analysis and publish XML sitemap to your site. This one is an incredible lead generation must-have WordPress plugin for your websites. Along with OptinMonster, you can create custom pop-ups and opt-in forms for your site, and convert your users into the subscribers. This way your email subscribers list will increase too. The features of OptinMonster includes analytics, page-level targeting, exit intent technology and split testing that lets you exhibit opt-in form while any user is ready to exit from your website. A/B testing is an advanced feature to analyze which form works. No doubt that images and graphics play a vital role in decorating blog post as well as delivering your message to readers. It’s human nature that they remember graphical data for a long time, in other words, it’s easy to remember. But using too heavy images can slow down your site and frustrate visitors. So, you should compress images before uploading. ShortPixel is one of the best tools I used to compress images. Most of the time it reduces the overall weight of pictures upto 50% without degrading quality. On the other hand, choosing an SSD host can also play a vital role to speed up your website’s performance. If you are looking for any best images compression WordPress plugin, you should try it. I found it recently and fall in love. Now I use it every time when I need to optimize my blog images. The plugin is the trendiest link management tool for your website. Its features involve cloak links, auto insertion on particular keywords, affiliate links, and link exports. Hence, if you are interested in formulating affiliate marketing for your website, then you should go for this plugin. You would notice that quite many users are willing to login into your website by inaccurate attempts. This login has the ability to set a limitation on all those failed logins. If the number of attempts crosses over from the identical IP range, then the Limit Login WP plugin can lock the admin part from that very range. It’s one of the most important plugins to protect your website against suspicious activities. For your WordPress website, Gravity Forms is yet another beginner as well as a developer-friendly plugin, mainly a contact form. With this WordPress plugin, you can insert any type of online forms in your site. You can also craft web directories, user-submitted posts or online surveys where user key needed. The blog comment system hugely can be transformed by the Disqus plugin that can very well revolve your blogs into the leading social media community. With this tool, you can craft a better yet interactive blog community that has an association with the best online social media networking sites. Your comments and also your readers can add to your blogs. Some of its settings will show fewer advertisements so that additional ads revenue can earn. Sucuri plugin is used to check the security of your sites and one of must-have plugins for WordPress powered websites. As your site can be hacked by hackers anytime, Sucuri will provide you with actual time alerts, malware removal service and site security scanner. This can superbly boost your WordPress blog security. AdSanity is reflected upon as WP advertisement plugin that approaches with shortcodes and widgets for exhibiting ads. Time-based advertisements can also be craft and also infinite ads that will run till you eliminate them. AdSanity also includes graphs and stats for clicks and ad views. You may exhibit a widget or hide them on some pages. So you can take the help of Display Widget to show or hide on particular pages and posts. You can also exhibit widgets to those users who are logged in as well as show specific widget on a specific page or post. When you are posting beautiful images on your WordPress sites or you own a photography site, then Envira Gallery is just appropriate for you. You can produce brilliant image galleries with great efforts. Envira Gallery WP plugin loads very quickly and appears remarkable on every device. This is the best free version for your WordPress site. The most responsive WP slider plugin in the market is Soliloquy plugin. Another essential plugin for portfolio based or any other gallery sites. It’s fastest and won’t disappoint you at all as your sliders will work smoothly. It arrives with attractive beneficial features and also includes a free version that you can attempt at that very moment. Edit Flow is another one of must have WordPress plugins that offer you a well-organized editorial workflow managing system for your site. It will provide you to see your assign posts, manage authors, editorial calendar, editorial comments, etc. With the aid of this plugin, you can craft your custom post status, and arrange your content strategy well on your WP dashboard. While sorting out your contents on your site, tags, custom taxonomies and categories play a vital part in executing it. Quite many beginners are not aware of the variations between SEO practices and tag use. Here Term Management Tool plugin helps you to unite and edit tags, categories, and custom taxonomies nicely. WordPress produces a lengthy list of your monthly archives. While blogging, if you have added monthly archives, your users will have to scroll a lot. So here comes Compact Archives for resolving your issue by the exhibition of your monthly archives in a compacted block. 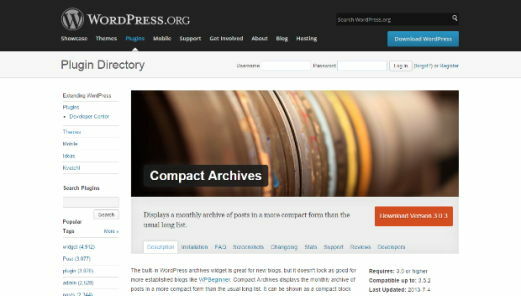 So make sure to create compact archives with this important WordPress plugin. Hence, you can hand-pick one of the best and your favorite must have WordPress plugins and apply on your website. This will assist you in creating your daily life much easier as you can upload your services quickly and expand your business too by reaching to your audiences. Do let me know which plugins you think are important for WP sites and is there any essential WordPress plugin I have missed on this list?